I rode a crotch rocket when I was in college and was a big fan of sport bike racing. 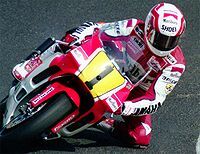 I remember Eddie Lawson tearing up the track with that distinctive red and white striped Marlboro bike… you couldn’t miss it. Although, I never had the money to buy a real riding suit, I knew if I could, it would have been a Dainese. In all his championships, Lawson wore the Dainese suits with the devil emblem strategically placed on the knees. Just sharp. About 9 months ago I was looking to replace my worn out pads (Troy Lee Brian Lopes model); I knew Dainese made nice motorcycle stuff but didn’t know much about their mtn bike protective gear. I’ve always noticed them on display at a LBS and thought this was a good a time as any to give them a shot. Upon a closer look, what I noticed is how well they’re made. Knowing they make gear that can hold up to 150 mile an hour crashes, it’s natural to think that they’d apply their production standards across all their products. No doubt, these are quality pads. The 3X design is a blend of minimalism and purposefulness. What you see is there for a reason. Visually, they look like most other pads in this class, but take a closer look and you’ll find it’s a look unique to only Dainese. I must admit, I’m a fan of European styling, and the understated look of these pads were both beautiful and functional. You’ll see it in the details from the hinged joints meant for easy bending to the minimal amount of straps used to reduce binding sensation that straps have, as well as weight savings. 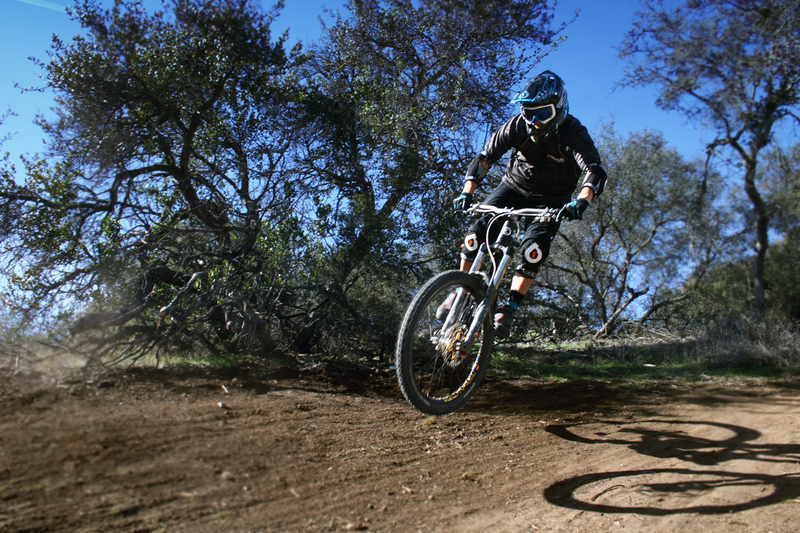 The pads are low-profile so they can be worn under clothing, when seen on a rider, there’s not a lot of bulk; they don’t protrude out which reduces the chance of them getting snagged or hitting something on narrow trails. Riding with them, you’d hardly notice they’re on as they’re relatively light and stay in place with minimal shifting. For the amount of coverage, they breathed incredibly well, this is due to using material where it’s needed which keeps the pads light and airy. The 3X pads come only in Medium and Large sizes. This is where perhaps the euro design thing is a bit odd as the mediums actually fit like a small in most other brands. These pads appear to have been designed in 2 lengths where they use average thigh, calf and ankle measurements to give you enough strap length to fit on a small or a medium rider. I’m 5’5″ and 155 lbs and the mediums fit just fine. So if you’re a true small, the mediums would be fine. If you’re a medium on the slender side, the mediums would be fine. The large my guess would accomodate, obviously large riders but could accept an XL slimmer type bodied rider. Your best bet is that if you’re interested in these pads, go try them on at a shop. You’ll be gambling buying these online to turn out they don’t fit. Riding with the Dainese 3x Pads. I’ve been riding with my set now for 9 months, needless to say, riding with these pads as previously mentioned, you’d hardly notice them once you hit the trails. Overtime, the padding will naturally break in and take on the shape of your arms or legs and they will stay put with little shifting. When brand new, you will experience some movement but that would be expected with any pads in this style. What I like especially with these pads is the articulation of the elbow and knees. Each pad has 2 parts and work independently, so when you bend your arms or knees the top and bottom move separately. These pads have saved me on several occasions. I’ve had a few minor get offs where I know the best way to protect my hide is just to slide on the pads similar to how skateboarders slide when crashing in half pipes. 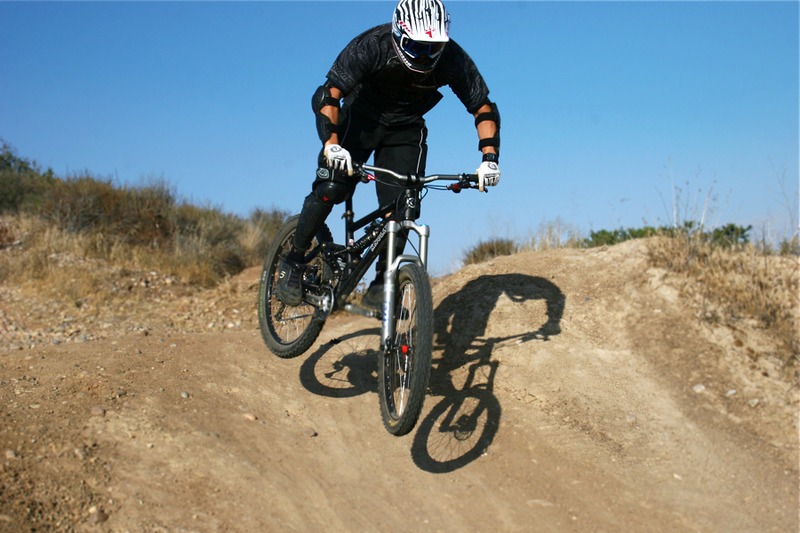 Obviously, dirt and rocks have more friction than a smooth half pipe but I’ve relied on this technique with both knee/shin and elbow guards to help minimize injuries. 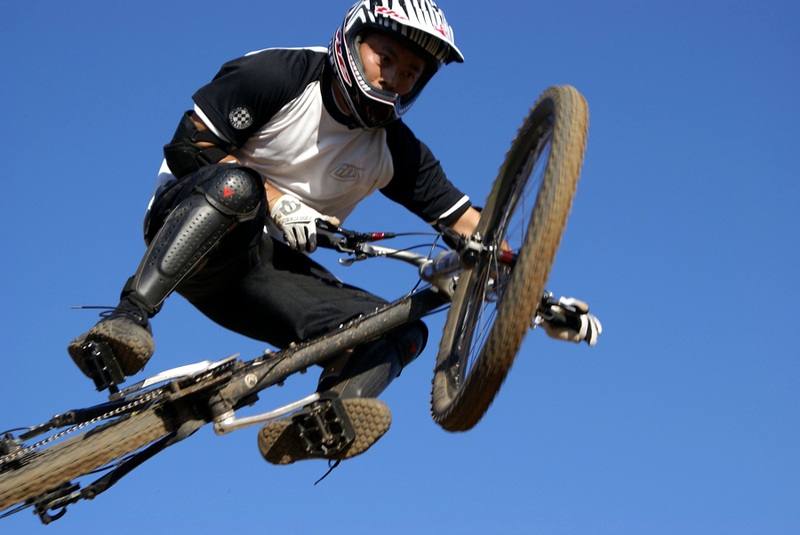 While the pads do offer a modest amount of protection, there are other safety measures you might consider when riding more aggressive terrain. It’s pretty easy really, the more coverage you have on your body the better off you’ll be. With all the spills I’ve taken, these pads have held up remarkably well. The plastic is scuffed up and there’s a few pedal gouges, but overall they still look good and the materials have held up. I’ve washed them several times in the washer. The fabric is still the original color with no apparent fading and the stitching is still holding strong. One important thing that’s often overlooked is the durability of the straps. Velcro straps tend to wear out over time but Dainese uses some super duper velcro that has essentially gone unchanged in the time I’ve had them. In terms of mileage these have plenty on them and I’m impressed with how long they’ve lasted. Dainese pads are harder to find because not a lot of shops carry them (they’re on the high end pricing range). The Knee/Shin Guards retail for around $90 and the elbow pads retail for around $70. You can find them usually online at hucknroll.com (look for the banner ads on this site). You can also visit the manufacturer website at their summer sport section http://www.dainese.com/us_en/multisport-summer to get more details or check out their other product offerings. GOOD: Dainese oozes high style and high quality. These pads are the Ferrari of pads. Well designed, form fitting and performs well. Their durability and construction is top notch. BAD: Rear calf protection on the knee/shin guards would be nice. The non-standard sizing is a little tricky and they are a bit high on pricing.